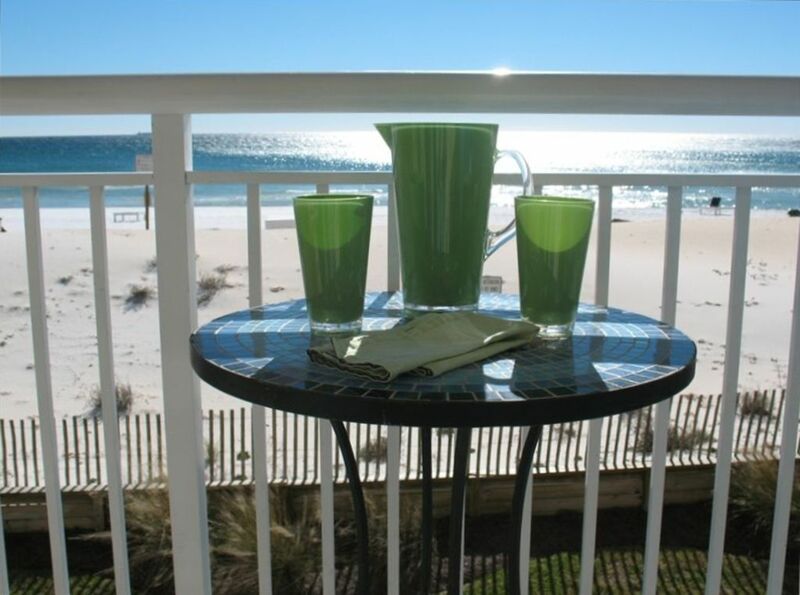 GULF FRONT CONDO- AMAZING VIEW- WE NOW OFFER COMPLIMENTARY BEACH SERVICE! CHECK OUT THE VIDEO ON THE WEBSITE ! THREE NIGHT MINIMUM MOST DATES. PLEASE CHECK THE CALENDAR FOR AVAILABLE DATES THROUGHOUT THE YEAR. ISLAND SANDS IS LOCATED ON ONE OF FLORIDA'S MOST BEAUTIFUL BEACHES. THE SAND IS SNOW WHITE (SEE PHOTOS) AND READY FOR GUESTS TO ENJOY. THIS UNIT IS GULF FRONT WITH A PRIVATE BALCONY - THE VIEW IS AMAZING WITH NO OBSTRUCTIONS BETWEEN YOU AND THE WATER. IT WAS BUILT PARALLEL TO THE EMERALD GREEN WATER AND LOCATED AS CLOSE TO THE WATER LINE AS ALLOWED BY LAW IN OKALOOSA COUNTY!! THE BEACH IS LESS THAN 30 FEET FROM THIS UNIT!! It was decorated with comfort and tranquility in mind. The colors are subtle and relaxing. It is both FUN and FANCY with palms, seashells, stripes and polka dots. This unit has a queen-size bedroom with private bath. The living room has two queen-size sleeper sofas so there is plenty of sleeping room. The living room opens with 6' patio doors to a private balcony that overlooks the beach and out to sea. There are tables & chairs for your comfort while on the balcony. It has a large equipped kitchen, dining area, and living room that was designed to take full advantage of the beautiful beach and ocean view. This unit has all the customary appliances that make packing easier, including microwave, refrigerator, dishwasher, washer and dryer, toaster, blender, coffee maker, cooking utensils, 36' Wide Flat Screen HD, TV,DVD,VCR, CD player, and iron. Linens, soaps, and paper products are also provided. We now have free wireless internet service. This complex of 27 units has a private boardwalk to the beach, well kept grounds, reserved parking, picnic and grilling area and a freshwater swimming pool with lounge chairs and bathrooms. This condo has all the extras that make vacationing more enjoyable. It is beautiful, comfortable, convenient, and economical... the ideal place to spend your holiday or vacation! By way of introduction I am a recently retired bookkeeper. Until now I worked for the City School System in my hometown, Tuscaloosa, Al.. Being retired gives me the time to put all of my energy into the rental business. I rent daily & weekly accommodations in Florida, Gatlinburg, Tennessee and guest quarters for Special Events in Tuscaloosa, Al.Renting these units are satisfying and provide a service that is needed and appreciated. The extra bonus Is I meet people from all over the United States. I started this rental business in 1988. My goal is to give every guest the best accommodations at the best rate. When my guests are happy, I'm happy! I fell in love with Okaloosa Island when I watched an engineer build a huge sandcastle on the beach one afternoon. The castle had candles inside the tunnels and a moat surrounding. It was quite a work of art. I watched until the emerald green waves washed it away at dusk. I was hooked, no pun intended! The sand on the beach was so white, the sunsets amazing and the town was perfect. It had everything to offer within 3 miles. It was 6 miles from Destin Harbor so had the same emerald green water as Destin without the traffic. The unit itself was large and had a huge balcony overlooking the Gulf. One of my loyal snowbirds describes it as a "'Million Dollar View"'. This unit is decorated with comfort and relaxation in mind. It is tasteful but fun. It is larger than most one bedroom units because it was built before they began to run out of beach so is roomy and has all the amenities needed. The amazing ocean view can be seen from the kitchen, eating area, living room and private balcony that overlooks the Gulf. GULF OF MEXICO CAN BE SEEN FROM THE KITCHEN, EATING AREA, LIVING ROOM AND LARGE BALCONY. Bedding for three beds provided. Bath towels, hand towels and wash cloths are provided. Beach towels are not provided please bring your own beach towels. Assigned parking spot right under unit. Additional parking on the premises. Beach towels are not provided, please bring your own. Plates, cups,bowls, colander, flatware, measuring cups, wine opener, glasses, wine glasses. Over 25 dvd's are provided. Ranging from toddler friendly & teen movies to award winning movies the entire family can enjoy. Located in the drawer under the wide screen T.V. in the living room. Patio furniture, table and two director height chairs. Pool is on parking lot side of complex and is not heated.